The handset manufacturer, Oppo, will launch its new smartphone Oppo F9 Pro in India today. The specialty of Oppo F9 Pro is the VOOC Flash Charge technology for dual rear camera setup and fast charging in it. Oppo F9 will come in the name of Oppo F9 Pro in India. Oppo F 9 was launched sometime in Vietnam. Pre-booking of 4GB RAM variants of Oppo F9 C has also been started. Oppo F9 Pro will be on the live streaming company's official website. It is expected that the 6 GB variant of Oppo F9 Pro will be launched in India only. Oppo F9 Pro will be launched in three color options. 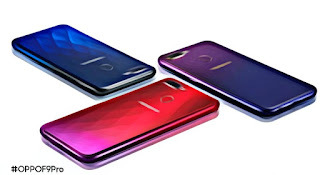 According to the Vietnamese website of Oppo, 4 GB Variants of Oppo F9 will cost 7,990,000 Vietnamese dollars (about 23,500 rupees). The price of this handset in India will be sold at the price of OPPO in India. It will be made available in Sunrise Red, Twilight Blue and Stary Purple colors. Vietnamese website has confirmed the specification of OPPO 9 or Oppo F9 Pro. This handset of Oppo, with two SIM slots, will run on Android 8.1 Orio. The smartphone will have a 6.3-inch full-HD + (1080x2280 pixels) display, with 19.5: 9 aspect ratios. Smartphone will be given the ARM Mali G2 MP3 GPU with MediaTek Helio P60 Octa-Core Processor. This smartphone will get 6 GB RAM / 128 GB storage. Apart from this, both Variants also have support for MicroSD card upto 256 GB. India is expected to bring 6 GB RAM variants. Speaking of specification, Oppo F9 Pro will have a waterdrop display design. Dual rear camera setup and fingerprint sensor will be found on the back panel of the smartphone. The power button on the right side of the phone and the button to raise voice and reduce the left side. USB-C port, 3.5mm audio jack for charging on the lower part of Oppo F9 Pro will get. primary camera with F / 1.85 aperture on the back. Secondary sensor is 2 megapixels and LED flash is also given. The front panel has a 25-megapixel camera with F / 1.0 aperture. Oppo F9 will have a battery of 3500 mAh with Wake Flash Charging. The connectivity features include 4G VoLTE, Wi-Fi 802.11 AC, Bluetooth 4.2 and GPS. The dimensions of the smartphone are 156.7x74x7.9 millimeters.